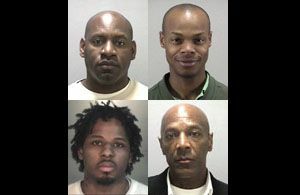 Defendants in a 2010 case. OAKLAND — Wheeled into a courtroom where she spoke reluctantly and weakly to a judge, the owner of an embattled security firm tied to former members of Your Black Muslim Bakery said she suffers from “anxiety, heart complications and depression” and no longer runs day-to-day operations of the firm, even as she pursues lucrative government contracts to guard Oakland City Hall and a stretch of shoreline near the Port of Oakland. Rory Parker, owner of BMT International Security Services, pleaded with a judge Friday to not be deposed in a lawsuit against her firm and Alameda County over an unlicensed BMT guard who severely beat a man while assigned to protect a county building. “I feel that the medication I am currently taking prevents me from expressing the full intent of my situation,” Parker said in court Friday morning, after Alameda County Superior Court Judge Ronni MacLaren refused to let another woman speak on her behalf. The county awarded Parker’s firm a $426,000 contract in 2012 to guard public property. Just hours after the work began, a BMT guard fought with a rival firm’s guard outside a public works office in Hayward and beat him with a flashlight, according to a police report. County supervisors rescinded the contract eight months later after the lawsuit by the injured man, Robert Chamberlin, revealed that BMT had presented bogus insurance documents. The lawsuit accuses the government of negligence in hiring BMT. Parker is acting as her own attorney. She and three women who accompanied her Friday refused to talk to a reporter outside the courtroom. It was the first time Parker has appeared for the case since Chamberlin filed suit in 2012. MacLaren has already ruled three times that Parker has not shown enough evidence of medical problems to not participate, but the judge said Friday she would take Parker’s new comments under consideration. But even as she battles the allegations surrounding the defunct Alameda County deal, Parker and other BMT associates have been trying to secure even bigger government contracts in Oakland. BMT is one of several firms fighting for a $2 million contract to protect Oakland City Hall, Frank H. Ogawa Plaza and other city property. Parker also won approval from the Port of Oakland Commission in November for a $450,000 job to patrol Middle Harbor Shoreline Park, though the final details of the port contract are still being worked out. Parker won the county and port contracts by appealing to local policies favoring firms that certify themselves as a “small, local, emerging business” — known in county government parlance as a SLEB. She is fighting for the Oakland City Hall contract on the same grounds, winning support from some City Council members who want to push BMT and another Oakland-based firm, ABC Security, to the top of the list of competing firms even though the city’s existing San Francisco-based contractor ranked higher in the formal bidding process. BMT and ABC “will hire more Oakland residents,” said Councilman Noel Gallo at a contentious Feb. 11 committee meeting as he sought with another council member, Rebecca Kaplan, to give the contract to the two firms against the recommendation of city staff. Two other council members disagreed. The full City Council is set to make a decision Tuesday. BMT is indeed local, headquartered in a Black Muslim temple building called Elijah’s University in northwest Oakland, a spinoff of Your Black Muslim Bakery, which shut down in 2007 after its leader, Yusuf Bey IV, ordered the killing of journalist Chauncey Bailey and two other men. Bey IV is now serving a life sentence. Parker’s son, Dahood Sharieff Bey, was a top disciple and “spiritually adopted son” of Your Black Muslim Bakery founder Yusuf Bey, who died in 2004. Dahood Bey now leads Elijah’s University, according to court records. Another longtime Your Black Muslim Bakery associate, Basheer Fard Muhammad, has been representing BMT at public meetings for the port and City Hall contracts and was also BMT’s liaison for the Alameda County contract. Muhammad and Dahood Bey were tried together for torture in 2010 but pleaded guilty to lesser charges after a jury could not reach a verdict. Parker, again acting as her own attorney, sued the port in December and the city just over two weeks ago after it appeared BMT was not going to be favored for the new contracts, though she later asked to dismiss the port lawsuit. It was Basheer Fard Muhammad who announced the latest lawsuit to City Council members at the Feb. 11 public hearing, after criticizing the city for “unfair awarding of contracts” and a flawed bidding process that hurt BMT’s prospects. His comments came before Gallo and Kaplan pushed to give BMT part of the award.